Everyone can agree that custom doors are beautiful; But have you ever wondered how these beautiful doors are manufactured? 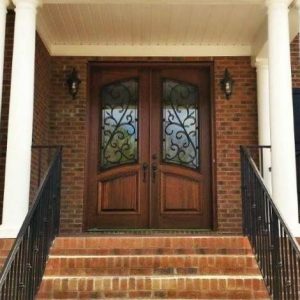 Southern Front Door has an original and unique process of bringing out the beauty in the material of your door. Contact us today and see how we can add a sense of elegance to your home. Inspecting and Hand Sanding. We carefully inspect the condition of the custom door before beginning the finishing process. Each door is sanded by hand to create a perfect base for the finishing process. Staining the Door with an Oil-Based Stain. Clients can choose from 22 different stain colors. The pigments in our stains are resistant to bleeding or fading mainly because of the use of oil-based stains. We leave the stain on the door for a certain time so the color can penetrate deeply into the wood. First Coat of Marine Grade, Oil Based Top Coat. The door is inspected again after the staining process. Then, it is lightly sanded by hand again to prepare for the application of the marine grade, oil-based top coat. Hand Sanding. Once the top layer has dried, the door is inspected, and hand sanded in detail. Second Coat of Marine Grade, Oil-Based Top Coat. The second coat of marine grade, oil-based top layer is applied. Hand Sanding. This step is the last inspection and hand sanding stage to ensure the beauty of the custom door. Third and Final coat of Marine Grade, Oil Based Top Coat. We apply a heavy final coat of finishing to provide extra protection against the outdoor elements. No interest financing for 18 months for qualified buyers. You deserve to have the door you want for your home on your terms, and we are here to help as much as possible. Visit us today so we can get to know your style and what you are looking for in dream custom door. Remember, we are committed to either meeting or beating our competitors’ prices. For more information, contact us at 281.890.5860 or visit our website here. We can’t wait to meet you!! !